Two of my resolutions for this year were to simplify things and to run more. These are, in fact, the same thing. The past several years I’ve been doing one or more triathlons a summer. Good fun for sure and a great workout, but logistically complex. I mean, I’m all for gear and equipment — it is, I believe, one of the reasons I wanted children — but needing a place to swim and the multi-hour stretches of time required to bike had become a bit onerous, especially when traveling. So simplifying for me was running: the perfect, low-tech, do-anywhere workout. But I’m still a sucker for exercise gadgets. (No, not that kind.) I used to run with a Garmin Forerunner GPS. It was bulky and didn’t monitor heart rate, so of course I wore a second watch that did do that. Wearing two watches (and an MP3 player) while running was a level of dorkdom I didn’t think I could achieve, but achieve I did. 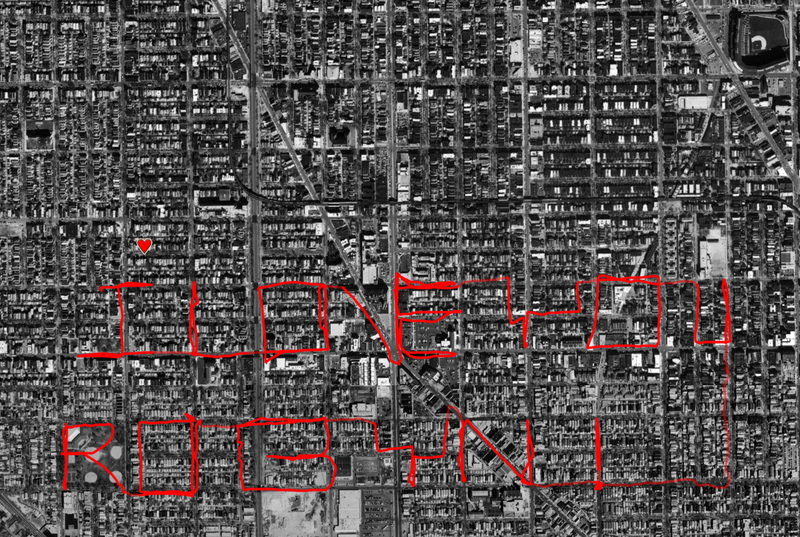 And playing with GPS allowed me to do nutty things like using the city as a giant Etch-a-Sketch. Unfortunately neither device played well with the Mac so all this wonderful data I was collecting couldn’t be manipulated easily. So, it seems that Nike/Apple are rolling out an upgrade to the service. There doesn’t seem to be a hardware change, but they’re branching out from just running. Apparently Nike is “in talks” with gyms and equipment manufacturers to allow the nano to plug directly into treadmills, ellipticals, stair climbers, and stationary bikes. So, basically, the piezo sensor in the shoe is bypassed and data from the workout is sent directly from the machine to the nano. That’s fine, except that in the past when I have run on a treadmill with the current kit I find that the pedometer does not agree with the treadmill distance. (After an 8 mile run the treadmill was off by nearly 3/4 of a mile.) Clearly there will be discrepancies for people who run both outside and inside. The strangest thing about the announcement is that Nike has developed a new, common workout “unit” called a CardioMile. My guess is that this enables users to “compete” against each other regardless of their preferred machine. But it does seem odd. I mean, mileage is mileage. If you and I are in a competition the person who runs furtherest (or fastest) first wins. But if I use the elliptical for 45 minutes have I “beaten” a person who was on the treadmill for 30? Kinda bizarre. How it will actually work is another matter entirely. Will it be a retrofit for existing exercise equipment or brand new machines? If the latter that’s a hell of a lot of stuff to replace because a few geeks want to plug in their iPods. Will the headphone connectors commonplace on workout equipment today now route audio from your iPod? Does the gym have to provide tech support? More promising was a USB port on the treadmill display. OK, now we’re talking! 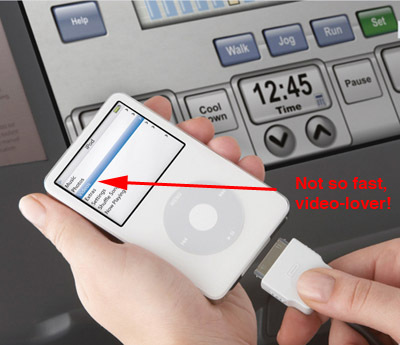 Save your workout data (generated from the treadmill) straight to the memory stick. Well, it didn’t work. I tried multiple USB keys, multiple treadmills over many days. Never did work. Inquiries to staff were met with blank stares and general dumbfoundity. It went something like this. And this is why I think the whole Nike+iPod machine integration thing might be doomed. Gyms will need tech support. Now, I’m not saying there aren’t a lot of fitness-obsessed geeks or tech-savvy meatheads, but the Venn diagram of hardware debugger vs. personal trainer for your typical club probably has a very tiny circle at its center. I just don’t see this sort of thing taking off. Which may be why the press release is on Nike’s site, not Apple’s. So, I go basic. Or as basic as I can still swaddled in the loving embrace of technology. Just running, just outside. We’ve quit our club. The city is now our gym. I’m signed up for a beautiful 10 mile race in April — my first in many years (and with my wife, who can run further than I can these days). And I’m considering a multi-leg 200 mile relay from Madison to Chicago. Not sure I can take the on-again, off-again but the prospect of running in the dead of night does hold a certain perverse charm. By the way, I’m still looking for a unified, standardized format for workout data. Microformats anyone? john, doesn’t the lack of a heart rate monitor trouble you in the Nike +? HR is one the primary measures of performance for me. Can’t imagine not having it. J — splurge for the Garmin forerunner 305 that includes the HR monitor. At least then you are only at level II dorkdom for wearing the forerunner and the iPod. WAY better than the level III dorkdom you described above.